If you need to hold more than one item of data you can use more than one variable. However if the data sort of belongs together it is more sensible to keep it together. Here the array is the red box. The first "box" inside that contains the number 4. 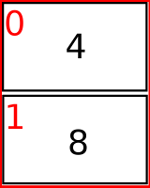 The two black "boxes" are known as array elements and the 0 and 1 are known as indexes. 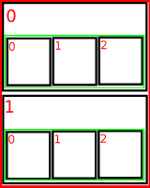 Indexes identify the element of the array. By the time you need this you should be ready for it!